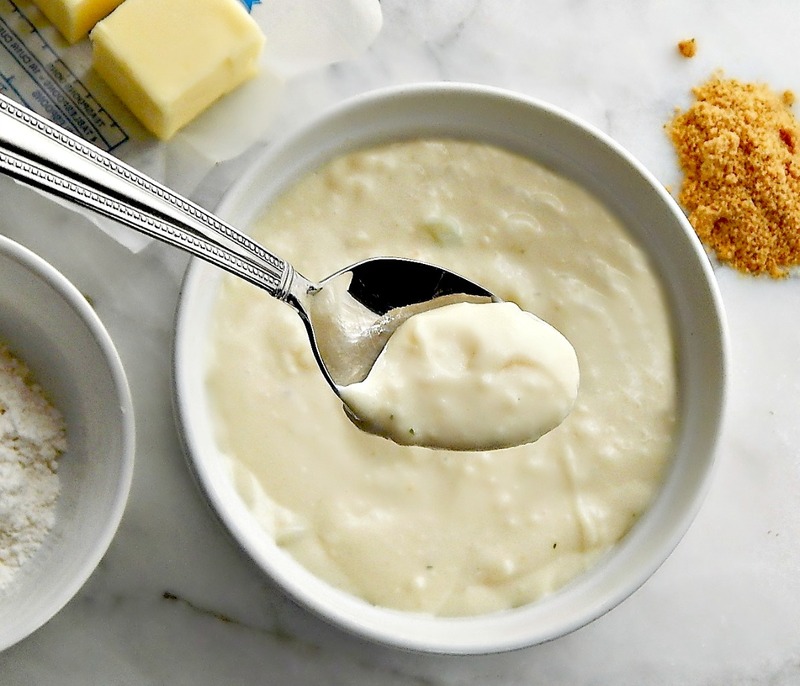 Cream of Anything Soup is nothing more, really than the perfect amount of a flavored White Sauce to substitute for just about any Cream Soup used in Cooking: Cream of Mushroom, Cream of Celery, even Cream of Chicken. While these soup recipes are not designed for eating on their own, and only meant to substitute for Condensed Cream Soups, these recipes are great in recipes when the texture, flavor or content of the final product really matters. They can easily be adjusted to be low sodium, lower fat, or gluten-free or paleo, all while using real, recognizable ingredients and flavorings. There’s no strange additives, no msg (or unclaimed ingredients that contain msg) and the only sodium is added by the cook (either as salt or a product that contains sodium) or naturally occurring in the ingrediets. Note that the Cream of Chicken recipe contains either a Chicken Bullion or Chicken Base, so what product you choose to add to your Cream of Chicken to make it “chickeny” is up to you. There are very good bases out there now that contain “natural” ingredients or cater to low sodium or other special diets. Check the bottom of the page where I talk about when it makes sense to make up a portion of this soup and when it makes sense to actually work the ingredients into your recipe. In a medium-sized saucepan, melt butter. Add celery and cook over medium low heat until softened. Stir in flour, whisking as the flour cooks for a minute or two and smooths out. Add milk, a little at a time, whisking until it’s all incorporated. Bring to a simmer and simmer gently, stirring now and then, until the mixture is thick enough to coat the back of a spoon and leaves a distinct line when a finger is run across it. It will thicken more as it cools. Add the celery seed and salt and pepper to taste. Use as a substitute for a can of Cream of Celery Soup. In a medium-sized saucepan, melt butter. Add mushrooms and cook over medium low heat until softened. Stir in flour, whisking as the flour cooks for a minute or two and smooths out. Add milk, a little at a time, whisking until it’s all incorporated. Bring to a simmer and simmer gently, stirring now and then, until the mixture is thick enough to coat the back of a spoon and leaves a distinct line when a finger is run across it. It will thicken more as it cools. Add salt and pepper to taste. Use as a substitute for a can of Cream of Mushroom Soup. In a medium-sized saucepan, melt butter. Stir in flour, whisking as the flour cooks for a minute or two and smooths out. Add chicken base and salt and pepper to taste. Use as a substitute for a can of Cream of Chicken Soup. If you are planning on using this in a dish that starts out with vegetables sautéed in butter (or oil) and then adds a Cream of Soup, there’s no need to follow the recipe for the “Cream of Soup.” Simply add, if not in the recipe already, the appropriate amount of vegetable (mushrooms or celery) and saute along with the vegetables in your recipe. Make sure there is adequate butter. For instance, if you are using a recipe that calls for sautéing an onion and bell pepper in one tablespoon of butter, and then calls for a can of cream of mushroom soup, you’ll increase the butter to two tablespoons and add your mushrooms right in with the onion and bell pepper. When they’ve softened, you’ll sprinkle in the flour, then work in your milk just as directed in the Cream of Mushroom Soup recipe. Many used to the flavor of canned soups in recipes find that the final product is blander when substituting a home-made Cream of Soup. Commericial Condensed Cream Soups tend to be very high is sodium and msg or naturally occurring msg that comes from other ingredients. Unless diet prohibits it, you’ll want to taste and adjust seasonings. A bit of Worcester sauce, celery seed, garlic powder and/or additional salt are ways cooks have amped up flavors of white sauces for year. A dash or two or Sherry or a bit of white wine might be appropriate. Per Recipe: 416 Calories; 24g Fat (51.4% calories from fat); 17g Protein; 34g Carbohydrate; 1g Dietary Fiber; 70mg Cholesterol; 490mg Sodium. Exchanges: 1 Grain(Starch); 0 Vegetable; 1 1/2 Non-Fat Milk; 4 1/2 Fat. Per Can: 250 Calories; 15g Fat (50 percent calories from fat), 2.5g Protein; 22.5g Carbohydrate;12.5mg Cholesterol;1740mg Sodium. Keep in mind that much of the calorie content from the homemade version is from the milk – something the canned variety has less than 2 percent of according to their can. I can also be certain that my family isn’t eating msg or strange preservatives, both found in the ingredients on the canned soup. With our foods so corrupted these days, it sure pays great dividend to either learn anew or to get reacquainted with forgotten arts again. They are so simple to do, and good for us, and naturally taste great 🙂 Your page is wonderful in helping so many get reacquainted. Good for you. That’s a very kind comment, thank you! I completely agree on all points! I sometimes think some of our “convenience” foods are a little silly – we pay a lot more money for things by buying them premade when they only take two, three, five minutes or so to make at home! Because people don’t “know” how to make even simple things, they think they have to choice but to rely on those products. In the meantime, the products are filled with more and more junk! Vicious cycle!